Owen George Yeo was born on the 8th June, 1892 at 32, Osbourne Road, Newton Abbot, his mother Mary was a general servant and no father was recorded. 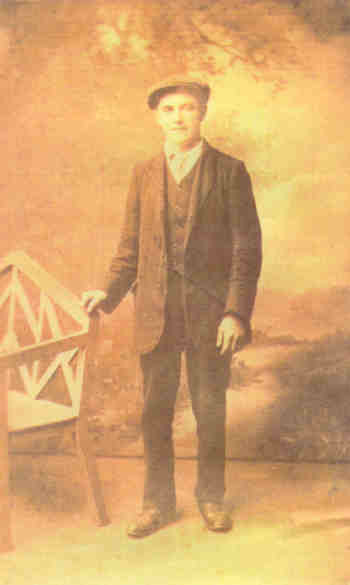 In 1901 Owen was still living at 32 Osborn Street with George and Mary Ann Tolley. He was listed as a boarder. Also with them was another boarder, Nellie Andrey aged 3. Owen grew up with the Tolley family and when George & Mary Ann died, it was their daughter, Laura who looked after him. Mary has never been traced, however we are almost certain she was the daughter of George & Jane Hill of Cheriton Bishop as in 1891 Mary was a servant girl in Torquay, working in the Torbay Hotel. When Owen married in 1914 he was living at 27, St James Road, Upton,Torquay, Devon and was a labourer for the Urban Council. However Owen was wounded in the first world war and received a pension for this. On the left a young Own George, the photograph was probably taken at the time of his marriage to Annie. My Granddad, Herbert Owen Yeo and his sister Evelyn taken c.1920. Taken at 146 Hele Road, Hele, Torquay, where the family lived for many years. Sitting (l-r) my Great Uncle Terence, Harry Babbage, my Great Aunt Betsy, Dennis Radcliffe (a friend)and my Great Uncle Owen. My Granddad Herbert Owen Yeo and his sisters Evelyn, Betty and Phyllis (known as Queenie). It was taken on Torquay sea front during WW2 when Granddad was home on leave. My Dad Herbert Philip John Yeo with four of his five sisters (it was taken before the youngest Lesley was born). Many thanks to Emma and Maureen for sharing these photographs with us.